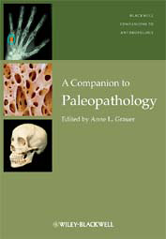 A Companion to Paleopathology offers a comprehensive overview of this rapidly growing sub- field of physical anthropology. Presents a broad overview of the field of paleopathology, integrating theoretical and methodological approaches to understand biological and disease processes throughout human history. Demonstrates how paleopathology sheds light on the past through the analysis of human and non-human skeletal materials, mummified remains and preserved tissue. Integrates scientific advances in multiple fields that contribute to the understanding of ancient and historic diseases, such as epidemiology, histology, radiology, parasitology, dentistry, and molecular biology, as well as archaeological, archival and historical research.Highlights cultural processes that have an impact on the evolution of illness, death and dying in human populations, including subsistence strategies, human environmental adaptations, the effects of malnutrition, differential access to resources, and interpersonal and intercultural violence.